A persistent voice change found not to be infectious, irritative, neurogenic, or the result of drug side effect. Instead, this represents a behavioral disturbance that may be associated with secondary gain. Often the vocal phenomenology of a nonorganic voice disorder-induced voice change is stereotypical and predictable in its manifestations; it is most often seen in young women. Normal vocal cord posturing with, accordingly, normal voice production. Same patient, moments earlier in the same examination, with nonorganic vocal cord posturing and, accordingly, nonorganic voice disturbance. 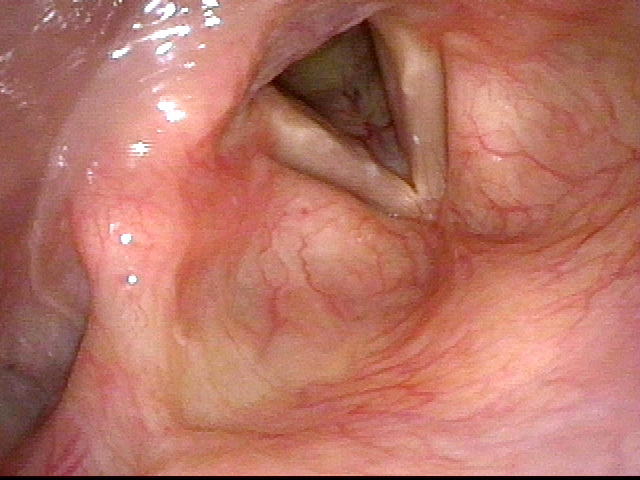 Breathing position, standard light, showing normal morphology and mucosa. Voicing position. During this moment of appropriate vocal cord posturing and tensing, we see normal adduction and hear normal voice. Strobe light, voicing, open phase of vibration. 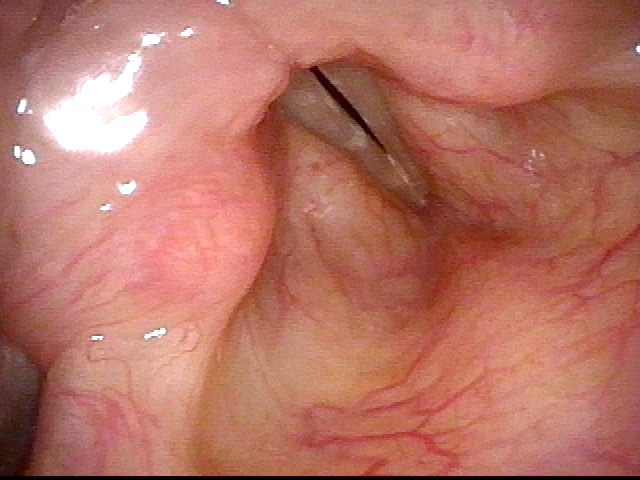 Nonorganic vocal cord posturing (see separate vocal processes) combined with nonorganic flaccidity (non-contraction) of the thyroarytenoid muscles such that the cords flap like unsecured sails in the wind (luffing). Only moments later, normal tension is returned volitionally to the vocal cords. The flaccidity is gone and vocal cord vibration and resulting voice return to normal. Panoramic view of normal breathing position with abducted vocal cords. Vocal cord position for normal voice. Abnormal voice created on a non-organic (functional) basis: Vibratory blur of supraglottic tissues - especially arytenoid mounds - create an inappropriate, rough, growling voice. 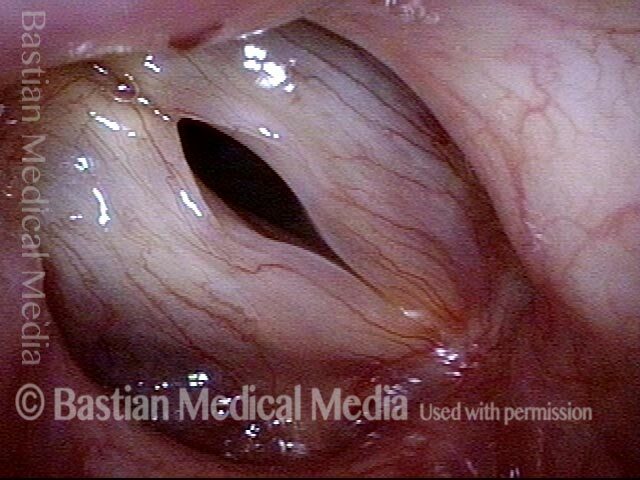 In this video, you will see what the larynx looks like when a person with a nonorganic voice disorder makes voice, you will hear the clinician beginning to coax out the patient’s normal voice, and you will hear the patient learning to control this re-discovered normal voice. 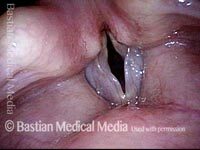 This entry was posted in Multimedia Encyclopedia and tagged Disorders, Nonorganic & functional voice disorders, Photos, Videos, Voice & other larynx disorders by admin. Bookmark the permalink.